Thank you for your thoughtful comments on Bike “Parklet” today. Great discussion today on FB. My view? I support it because it ADVANCES cycling infrastructure downtown. It moves us forward, providing over 40 cycling slots instead of parking for one car. We may not always agree on how to get there, but we must always keep on our eye on the goal, which is to provide the best cycling infrastructure in the Midwest. We need to celebrate each step forward. I know the organizers of this Parklet welcome this feedback both positive and negative because that is the precisely the point of public art: to stimulate reaction and discussion about the meaning of place. Love it, or hate it, that parklet is now part of our downtown fabric, and now that the decision has been made, let’s support it, and in particular, the community members who made this project a reality. I also greatly admire all of the people on the committee as well. Each member has made valuable contributions to our community for a number of years. I know each and everyone would welcome your feedback both good and bad, and would also invite you to participate on any future projects. Does this mean that this process was perfect, or cannot be improved? No. Of course not. We are all, myself included, imperfect people trying to perfect our community. I hope that the organizers will not get defensive about the negative feedback. I view that as an absolutely essential component of improving performance. Shortly, I will be posting on my first year of service on council, and I am going to be asking for what you have liked, and NOT liked. So I will subject myself to the same feedback that I am asking the committee to welcome. In closing, I want to share a memory about my favorite photo of my Grandfather Cole. He was a history professor in South Dakota, Minnesota and New Mexico. He loved nothing more than a vigorous debate over a piping hot cup of coffee (and usually an unfiltered Camel too). The photo shows my grandfather sitting in his living room while talking with his college students about the New Deal (at least that is how I always imagined it). He was an FDR progressive, and occasionally supported Norman Thomas in the 1920’s (the Bernie of his day). He had a smile on his face, and a twinkle in his eye while talking about the most controversial issues of his day. We should follow his example. Let’s celebrate that we don’t always agree, and we should welcome vigorous debate without getting mad at one another. As Larry Baker reminds us, we live in Athens. Vigorous debate is why we love living here. FB is an intense medium. Just remember that while typing away on your comment threads, but don’t shy away from debate either. 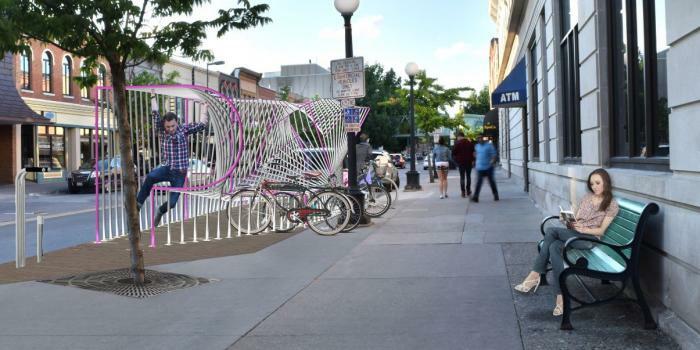 We need it to advance what we are trying to achieve, and that is why I support the Parklet. It has already stimulated debate and dialogue about the meaning of place, the long term role of commuting infrastructure, social equity, and optimal structure for collaborative partnerships between our non-profits, Downtown District and our City. Not bad for a hunk of twisted artistic metal… Let’s own it. It’s ours now! The above is a post from my Facebook page which was a follow-up to my question “What does everyone think about the new bike parklet downtown?” to which many comments and much discussion followed. You need to be a Friend of mine on Facebook to view that discussion on my page. You can learn more about the bicycle parking station on the City of Iowa City website.